^ "Location of Masjid al-Haram". Google Maps. Retrieved 24 September 2013. ^ Zeitlin, I. M. (25 April 2013). "3". The Historical Muhammad. John Wiley and Sons. ISBN 0745654886. ^ a b Daye, Ali (21 March 2018). "Grand Mosque Expansion Highlights Growth of Saudi Arabian Tourism Industry (6 mins)". Cornell Real Estate Review. Retrieved 9 February 2019. ^ Denny, Frederick M. (9 August 1990). Kieckhefer, Richard; Bond, George D. (eds.). Sainthood: Its Manifestations in World Religions. University of California Press. p. 69. ^ "Is Saudi Arabia Ready for Moderate Islam? - Latest Gulf News". www.fairobserver.com. Retrieved 25 November 2017. ^ "As we prepare to fall back, here are seven great clocks of the world". Los Angeles Times. 29 October 2017. ISSN 0458-3035. Retrieved 25 November 2017. ^ Carla Power. "Saudi Arabia Bulldozes Over Its Heritage". Time. Retrieved 25 November 2017. ^ Palmer, A. L. (26 May 2016). Historical Dictionary of Architecture (2 ed.). Rowman & Littlefield. pp. 185–236. ISBN 1442263091. ^ Alli, Irfan (26 February 2013). 25 Prophets of Islam. eBookIt.com. ISBN 978-1456613075. ^ Palmer, A. L. (26 May 2016). Historical Dictionary of Architecture (2nd ed.). Rowman & Littlefield. pp. 185–236. ISBN 978-1442263093. ^ Michigan Consortium for Medieval and Early Modern Studies (1986). Goss, V. P.; Bornstein, C. V. (eds.). The Meeting of Two Worlds: Cultural Exchange Between East and West During the Period of the Crusades. 21. Medieval Institute Publications, Western Michigan University. p. 208. ISBN 978-0918720580. ^ Dyrness, W. A. (29 May 2013). Senses of Devotion: Interfaith Aesthetics in Buddhist and Muslim Communities. 7. Wipf and Stock Publishers. p. 25. ISBN 978-1620321362. ^ Ibn Ishaq, Muhammad (1955). Ibn Ishaq's Sirat Rasul Allah – The Life of Muhammad Translated by A. Guillaume. Oxford: Oxford University Press. pp. 88–9. ISBN 9780196360331. ^ Guidetti, Mattia (2016). In the Shadow of the Church: The Building of Mosques in Early Medieval Syria: The Building of Mosques in Early Medieval Syria. BRILL. p. 113. ISBN 9789004328839. Retrieved 17 September 2017. ^ Petersen, Andrew (2002). Dictionary of Islamic Architecture. Routledge. ISBN 9781134613656. Retrieved 17 September 2017. ^ Ali, Wijdan (1999). The Arab Contribution to Islamic Art: From the Seventh to the Fifteenth Centuries. American Univ in Cairo Press. ISBN 9789774244766. Retrieved 17 September 2017. ^ James Wynbrandt (2010). A Brief History of Saudi Arabia. Infobase Publishing. p. 101. ISBN 978-0-8160-7876-9. Retrieved 12 June 2013. ^ "Gates of Masjid al-Haram". Madain Project. Retrieved 17 March 2018. ^ "Riyadh Expands Masjid al-Haram". OnIslam.net. 6 January 2008. Archived from the original on 28 December 2013. ^ "Historic Masjid Al-Haram Extension Launched". onislam. 20 August 2011. Archived from the original on 12 May 2012. Retrieved 17 November 2011. 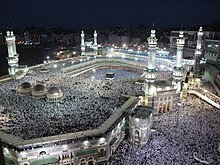 ^ "Saudi Arabia starts Mecca mosque expansion". reuters.com. ^ "King launches key Grand Mosque expansion projects". Saudi Gazette. 12 July 2015. Retrieved 9 February 2019. ^ "Makkah crane crash report submitted". Al Arabiya. 14 September 2015. Retrieved 15 September 2015. ^ "King Salman to make findings of Makkah crane collapse probe public". Retrieved 14 September 2015. ^ "Number of casualties of Turkish Haji candidates at the Kaaba accident reach 8…". Presidency of Religious Affairs. 13 September 2015. Archived from the original on 26 September 2015. Retrieved 15 September 2015. ^ "Six Nigerians among victims of Saudi crane accident: official". Yahoo! News. AFP. 16 September 2015. Retrieved 16 September 2015. ^ Halkon, Ruth; Webb, Sam (13 September 2015). "Two Brits dead and three injured in Mecca Grand Mosque crane tragedy that killed 107 people l". Mirror Online. Retrieved 16 September 2015. ^ "Saudi Arabia to restart work on $26.6 bln Grand Mosque expansion". Reuters. 17 August 2017. Retrieved 14 February 2019. ^ "Names of Former Imams 1345–1435 Ah". Retrieved 3 May 2018. ^ WORTH, ROBERT F. (10 April 2009). "A Black Imam Breaks Ground in Mecca". The New York Times. 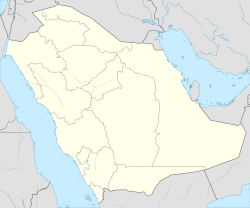 RIYADH. 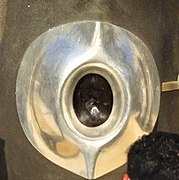 ^ "Imām ibn Kathīr al-Makkī". Propheticguidance.co.uk. 16 June 2013. Retrieved 13 April 2016. ^ General statistics of the Umrah season of 1436 A.H. until 24:00 hours, 28/09/1436 A.H. Total Number of the Mu`tamirs: 5,715,051 "General statistics of the Umrah season of 1436 A.H." The Ministry of Hajj, Kingdom of Saudi Arabia. Archived from the original on 13 August 2015. ^ "As Hajj begins, more changes and challenges in store". altmuslim. Archived from the original on 11 January 2012. Wikimedia Commons has media related to Great Mosque of Mecca.